For more than 30 year the passion of Quali-Fi for good and well-defined sound has been a driving force. In early 2009 they got their ideas organized into a shared vision of creating a series of loudspeakers with sustainable design and uncompromising sound quality. The basis for their work is a series of innovations that have changed the audio area radically during the last 10 years. Clarity and detail above all - design with full-range units. Simplicity above all - no-nonsense designs. Efficiency above all - development of sustainable and low energy cabinets. Music lovers above all others - sophisticated three-dimensional sound. The philosophy behind the designs is a mixture of old principles, developed by sound pioneers in the first half of the 20th century and the latest technology in speaker and cabinet design. They then added the sustainability to the recipe. Quali-Fi creates unique listening experiences without having to compromise on sustainability - pure sound - pure and simple. The hiQ design line feature cabinets in laminated bamboo, which is a uniquely sustainable material. The impact on Earth s ecosystem is a very welcome side-effect of the use of bamboo. However it is the plant s acoustic and aesthetic qualities that makes it ideal for the speaker cabinets. The simplicity and the clean lines of the cabinets are combined with full-range drivers of the highest quality. The full-range drivers provide details in sound that are unbelievable, they fi ll the room with a three dimensional sound stage in a way that is rarely matched. Again we see that the simplest solution often is the most optimal. Kurt is originally educated as an acoustic engineer but has always worked with software, management and marketing. 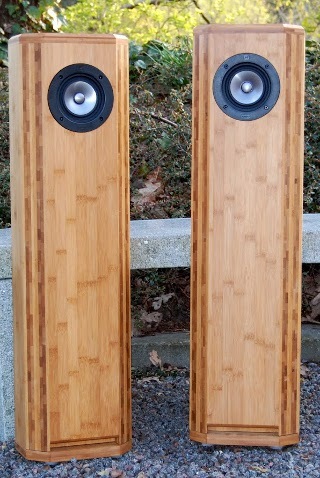 A passion for speakers and especially full-range designs, however, has accompanied him since the early 1970's. 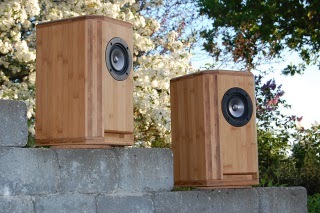 In the 90's he built a small series of special speakers to the custom-build and enthusiast market. At the discovery of Mark Fenlon's groundbreaking speaker units, Kurt saw the possiblity of converting a lifelong passion into a business. He contacted Ole Brøndum with the idea of creating Danish quality loudspeakers centered on music appreciators, sustainability and aesthetics. Ole has tried a little bit of everything, but in the 1970's and 80's he was practically Mr. hi-fi in Denmark. Ole owned the company Quali-Fi, which imported a wide range of quality products including speakers from JBL. Quali-Fi also supplied audio equipment for the national broadcasting service (Danmarks Radio), recording studios, concert promoters etc. and started the hi-fi wave for ordinary consumers in Denmark. Back in those days, JBL were the Mercedes' of loudspeakers. Ole has always had a passion for music - all kinds of classic and acoustic music and for speakers that can reproduce the music properly. So it did not take much persuasion before Ole fell for Kurt's speaker project and together they revived the Quali-Fi name. Ole has listened to almost everything when it comes to loudspeakers, and he says: "Regardless of price range, I have never heard anything the makes the speakers disappear and the music come to the forefront and step into character as our Bach with Alpair7 does. Unfortunately though, there now is a part of my music collection I do not want to listen to anymore, because I now can hear how bad the recording quality is." When producing the bamboo boards, Quali-Fi uses in their hiQ cabinets, the bamboo poles are split into strips, hardened, carbonized and laminated. The result of the process is a material that is incredible non-resonating, damping resonances far more effi ciently than the materials normally used in speaker cabinets. The material also has a wonderful warm glow enhanced with bees wax. The hiQ design line features full range speaker units from Markaudio in Hong Kong. Cone, suspension and cap are manufactured to standards and tolerances so far not seen in speaker manufacturing. The result is extraordinary sound detail and an amazing three-dimensional soundstage. Enlarge The Mozart loudspeaker is actually a throw-back to the 70's where the company Epicure Products Inc. ("EPI") had great success with their so called Micro Towers. 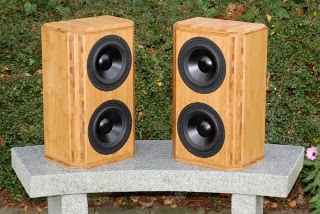 The original design was with two speaker units, one with a forward direction the other with a backward direction. Quali-Fi was so spellbound by the Markaudio Alpair 7 unit that they wanted to create a beautiful product that took up less space than their Bach speaker. At the same time it was their perception that the Alpair 7 unit, with its three-dimentional qualities, produced the optimal experience, when there was only one unit present with a forward direction. The result was Mozart. With its tall slender appearence it will blend into the room in an elegant way and become a piece of furniture or even art in its own right. Mozart is wider than it is deep, unlike most modern speakers. Actually it is only 13.5 centimeter deep, which makes it possible for it to be placed up against a wall taking up a minimum amount of space. The width is 22.5 centimeter and the height is 83.5 centimeter. The design is a so called "end-loaded TL ; a transmission route that ends in a port. Quali-Fi hase chosen to build the port into the cabinet itself, first of all because it looks better than a traditional round plastic port and secondly, because this type of port provides a higher acoustic resistive component in the port, which makes the bass sound more sturdy and not so 'booming' as it might in a traditional resonating round port. Naturally the developer also wanted their products to have a sustainable design, therefore as little plastic as possible is used. As you can see, the front is chamfered at a 45 degree angle. Aesthetically this presents a unique expression that exposes the refined structure of the bamboo. However, there is also an acoustic reason for softening the edge, it diminishes the diffraction of the mid range and Alpair 7's excellent three-dimensional qualities are demonstrated at their very best. Mozart is as good as Bach at providing nuances in the midrange area, although it might not fill the room with soundstage in quite as impressive a way. The bass is dry and recise and percussion instruments are exact and well-defined. The developer are convinced, that the company has found a good balance between form and function with Mozart. It is their experience that the sculptural effect of the tall slim cabinet is appreciated by female audiences. That is why Mozart is said to have a fairly high WAF (Wife Acceptance Factor). Mozart is designed in collaboration with David Dlugos from Planet10 hi-fi in Canada; he had the original idea for construction; Quali-Fi addapted it to the Alpair 7 and our bamboo design. Floor standing, end-loaded transmission line (a transmission line that ends in a port) with Alpair 7. Mozart is 835 mm tall, 225 mm wide and only 135 mm deep. Lots of musical detail in three dimensions, excellent midrange, low punchy bass without being boomy at all. Champhered edges prevent unpleasant sound diffraction in the mid-range. Aesthetically this gives a very unique expression that shows the beautiful structure of the bamboo. Front vent with high aspect ratio, supports the dry bass reproduction. The position also allows the shallow cabinet to be placed against a back wall. The Markaudio Alpair 7 operates up to 30 Khz and handles 20 Watts RMS. In the Mozart and Chopin cabinets we get clear bass notes at 45 Hz. 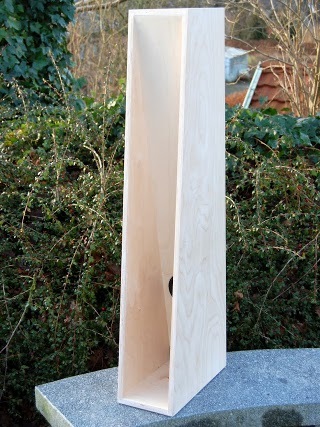 Enlarge After Quali-Fi had built the Mozart speaker, they were asked if they could design a version that could be placed in a more traditionel way, maybe on a bookshelf or on a speaker stand. The result was Chopin. Everything, everything what was said about Mozart, is also true for Chopin, which has the same inside volume as Mozart. The lower height makes Chopin act almost like a conventional bass reflex cabinet. Quali-Fi has however retained the special port design directly in the cabinet. This makes the difference between Mozart and Chopin minimal, only that Chopin has a slightly looser and less loud bass. They are, however, so close that even the trained ear can be deceived from time to time. The placement of the speaker in the room can easily make a bigger difference. Chopin is 39 centimeter high, 22.5 centimeter wide and 24.5 centimeter deep. Chopin should be chosen by those, who prefer the classic speaker look in contrast to Mozart's tall slim profile or by those, who space for it on a stand or shelf and not on the floor. Traditional shelf speaker with Alpair 7, 390 mm tall, 225 mm wide and 245 mm deep. Almost like Mozart, slightly less bass and in nature more like bass-refl ex. Chopin is very well suited to rhythmic music. Some also prefer the deeper cabinet s smaller infl uence on the mid-range. Forward fi ring vent for easy placement. The vent is built into the cabinet - no plastic tubes. Works also very well free-standing on a speaker stand. The champhered edges add visual design detail and reduces diffraction. The Häendel line of speakers is the latest series developed by QualiFi. The idea came from listening to older transmissionline speakers and noticing the clarity of the bass. At the same time they were experimenting with Open Baffle bass reproduction and came to conclusion that much of the experience of the lower octaves of musical reproduction depends on the impulse characteristics of the speaker. The listener s experience is not all about the frequency response but just as much about how the pressure wave develops in the first 10 to 20 milliseconds. All members of the Händel line can be ordered in different finishings. As the HiQ line they can all be delivered in silky smooth bamboo, but it can also be delivered in different paints or covered with cloth. Finally raw plywood cabinets can be delivered for those who prefer to do their own finishing. The adaptability of the Händel line is ideal for those who want their audio equipment carefully matched to their interior design. 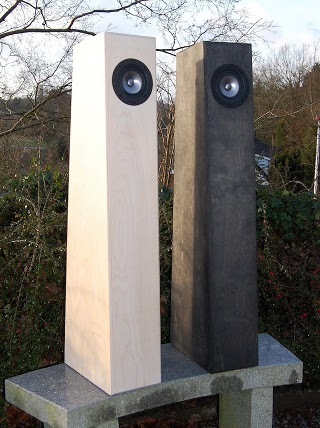 All of the Händel speakers have the unique three-dimensional and detailed sound. Their bass reproduction various with size and can suit any taste. Enlarge Enlarge The Händel Horn is a slim floorstander, a transmissionline horn hybrid with exeptional bass reproduction. Drums and and contrabass have a serious attack that brings the music to life in an extraordinary manner. This excellent rendering of bass is the main difference between this and the other members of the Händel series. The Händel Horn is suited as the main speakers in a stereo setup or as the front speakers in a home cinema installation. It is ideally placed at some distance from the rear and side walls. The rear firing horn mouth should not be backed completely up against a wall. The Händel Compact is smal slim transmissionline speaker with an upfiring port. It is suited for wall mounting or as a book-shelf speaker. The Händel Compact is very versatile speaker, it can be used stand alone as the main speakers in a stereo system or as front or rear speakers in a home cinema setup. Due to the upfiring port it can be placed against a back wall, in which case the bass is quite rich and nuanced, Imaging from any speaker placed on the wall is not as three-dimensional as a free-standing speaker, but some prefer the sound like this. If the Compact is free standing it may need a little equalizing to suite most peoples taste for bass. The Händel Center has similar dimensions as the Compact, however the speaker is at the center and the ports a rear firing. Consequently it should not be placed directly on a wall if bass performance is intended. It is however possible to stuff the ports with the supplied foam plug and transform the transmission line cabinet into a so-called aperiodic box. It will have less bass, but it will very precise in nature. Sufficient volume can be achieved by equalization. The Händel center is obviously well suited to act as a center speaker in a home cinema installation. For those who prefer the look of Händel Center over the Compact, it can also be used as main speakers in a stereo setup, placed at some distance from the back wall. The Händel Cube is a small speaker suited a a front, center or rear speaker in a home cinema installation. The Cube is an aperiodic cabinet with an upfiring vent. It has the same excellent rendering of the midrange and and treble ranges, it deliberately has limited bass output, as it is designed to be used with a subwoofer. Enlarge The Händel Baseline is a compact subwoofer with two 7 or 8.75 inch speaker units, one active and one passive. It can ordered either as a passive speaker or as an active speaker with a dedicated 200 watt amplifier. In order to achieve reproduction of bass notes all the way down to 30 or 25 Herz in a compact package, the concept of the passive radiator is used. A traditional bass-reflex cabinet would have to have a very long port. The principle works very much like a normal ported cabinet; the passive radiator acts as a resonator like the port. Many music-lovers, however, regard this as a superior design, as all sound radiates from cones, not from ports, so all frequencies are, so to speak, generated in the same way. The Baseline is used to supplement the lower octaves especially in home cinema installations. It can however also be used together with the Händel Cube as typical 2+1 setup. The Baseline can comfortably handle up to 150 or 180 Hz as it has a very linear frequency response. Savery is named after the Danish percussionist Uffe Savery, one of the members of SafriDuo. It is ideal to add an extra octave of bass to our hiQ design series, for those who prefer a strong bass, listen to Organ music or use the speakers in a home theater setting with lots of non-musical bass. Savery is specifically designed to match the other speakers in design, it is very compact - only 45 cm tall and 18 cm deep, it can be placed discretely against the back wall of the listening room. Savery uses advanced Wavecor balanced drive units with high power handling and long excursion for the very compact size. Specific tuning of the cut off frequency can be achieved by adding extra weights to the passive radiator. The Vivaldi line is effectively a budget version of the Händel line. The cabinets are made in MDF with a vinyl veneer covering, that fronts are made in painted MDF. The speaker units used are Markaudio s CHR-70 and CHP-70. The CHR-70 comes close to its cousin, the Alpair 7, in detail. The CHP-70 has a distinctly warmer and rounder sound with its paper cones. The Vivaldi Horn is a slim floorstander, a transmissionline horn hybrid with very good bass reproduction. Drums and and contrabass have a serious attack that brings the music to life in an extraordinary manner. This rendering of bass is the main difference between this and the other members of the Vivaldi series. The Vivaldi Horn is suited as the main speakers in a stereo setup or as the front speakers in a home cinema installation. It is ideally placed at some distance from the rear and side walls. The rear firing horn mouth should not be backed completely up against a wall. The Vivaldi Compact is small slim transmissionline speaker with an upfiring port. It is suited for wall mounting or as a book-shelf speaker. The Vivaldi Compact is very versatile speaker, it can be used stand alone as the main speakers in a stereo system or as front or rear speakers in a home cinema setup. Due to the upfiring port it can be placed against a back wall, in which case the bass is quite rich and nuanced, Imaging from any speaker placed on the wall is not as three-dimensional as a free-standing speaker, but some prefer the sound like this. If the Compact is free standing it may need a little equalizing to suite most peoples taste for bass. The Vivaldi Center has similar dimensions as the Compact, however the speaker is at the center and the ports a rear firing. Consequently it should not be placed directly on a wall if bass performance is intended. It is however possible to stuff the ports with the supplied foam plug and transform the transmission line cabinet into a so-called aperiodic box. It will have less bass, but it will very precise in nature. Sufficient volume can be achieved by equalization. The Vivaldi center is obviously well suited to act as a center speaker in a home cinema installation. For those who prefer the look of Händel Center over the Compact, it can also be used as main speakers in a stereo setup, placed at some distance from the back wall. The Vivaldi Cube is a small speaker suited a a front, center or rear speaker in a home cinema installation. The Cube is an aperiodic cabinet with an upfiring vent. It has the same excellent rendering of the midrange and and treble ranges, it deliberately has limited bass output, as it is designed to be used with a subwoofer. The Vivaldi Baseline is a compact active subwoofer. In order to achieve reproduction of bass notes all the way down to 30 or 25 Herz in a compact package, the concept of the passive radiator is used. A traditional bass-reflex cabinet would have to have a very long port. The Baseline is used to supplement the lower octaves especially in home cinema installations. It can however also be used together with the Vivaldi Cube as typical 2+1 setup. The Baseline can comfortably handle up to 150 or 180 Hz as it has a very linear frequency response. Savery is specifically designed to match the other speakers in design, it is very compact - only 45 cm tall and 18 cm deep, it can be placed discretely against the back wall of the listening room.